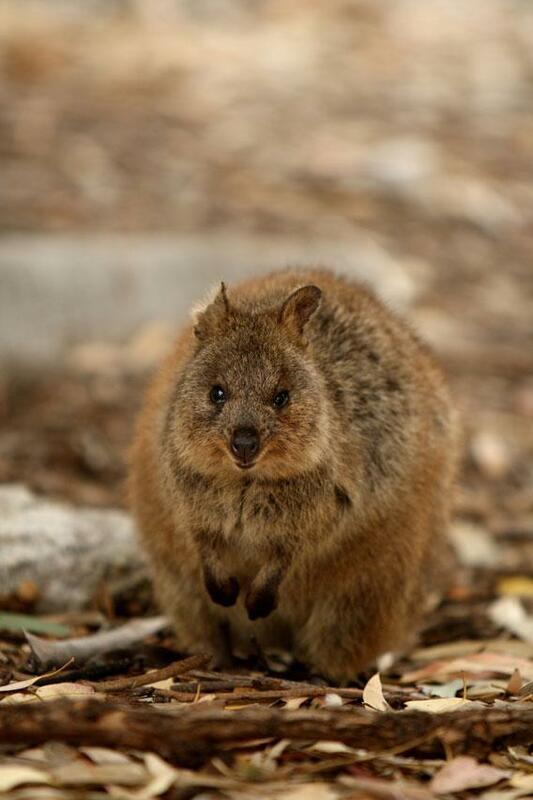 Quokka profile: Australia’s adorable, vulnerable marsupials. Am I the world’s most adorable creature? Hey guys! I’m a quokka (rhymes with mocha). Though I may seem impossibly adorable, I am a real, naturally occurring phenomenon: a house-cat-sized macropod, which is a type of marsupial, from Western Australia. Maybe you know my fellow macropod friends, the kangaroo and the wallaby? What else about me? I eat native grasses and wattle leaves. I forage. I am nocturnal. I live in societies of 25 to 150 adults, which are organized around dominant males. (The notion of an aggressive quokka may seem strange to you, but the guy quokkas don’t mind getting territorial about shelter during the summer because it’s hot outside.) Though I prefer to lodge in woodland stretches, dense shrubbery, and at the edges of swamps, I can survive in habitats that have virtually no fresh water in them, since I absorb most of the moisture I need from my vegetarian diet. (Believe me, friends, it’s all water weight.) Fun fact: I don’t chew my food, instead swallowing it whole and then regurgitating it as a cud. It’s divine. Sometimes I get muscular dystrophy, and scientists use me for medical research. You’re welcome! Aside from that, I am delicious and not terribly good at fending off predators. Do you want to hear the partial list I just made of animals that like to eat me? It goes: dingoes, dogs, house cats, feral cats, large birds, and foxes! A note of caution: You probably don’t want to confuse me with my meaner cousin, the quoll, who lives in Tasmania and New Guinea as well as Australia. He is carnivorous, largely solitary, and frankly a bit evil: I’ll spare you the details of how exactly he pins down and lacerates his prey, but it’s not pretty. Anyway! You are probably confused as to why a quokka is writing an article for Slate, so let me explain. First off, my pictures are irresistible, and upon seeing them, most of the editors wanted to declare 2013 the Official Year of Quokka Coverage and produce untold numbers of glowing profiles and think pieces gushing over me. But also, in February, a month-long series examines the future of fauna in a post-climate-change world. I am not a critically endangered species, but the International Union for Conservation of Nature currently classifies me as “vulnerable” on their Red List. Due to my restricted range, I am exactly the kind of creature that stands to suffer if harm befalls my tiny habitat. So read up, keep reusing those green grocery bags, dust off your bike, and leave your thoughts—about quokkas or climate change or the rest of the animal kingdom—in the comments.